Easy and healthy baked greek chicken & veggies sheet pan dinner is seasoned and cooked to flavorful perfection and couldn’t be easier with just one pan and a handful of simple ingredients. Merry belated Christmas!! If you celebrate Christmas, I hope it was the merriest you’ve had yet, full of everything and everyone you love and LOTS of good food. If you don’t celebrate this particular holiday, I still love ya and hope your December 25th was memorable in some other way and was at the very least, a peaceful and relaxing Sunday and that you got your batteries re-charged for a big week ahead. It’s that time of year when we’re making New Years Resolutions and goals for the upcoming months. I’ve got a little list going, on a sticky note as usual, and as always I’ve got some food-related aspirations for 2017. This one pan meal is a great way to kick-start your healthy eating New Years Resolutions. It’s easy to make, incredibly tasty, and quick quick quick – ready in about 30 minutes! 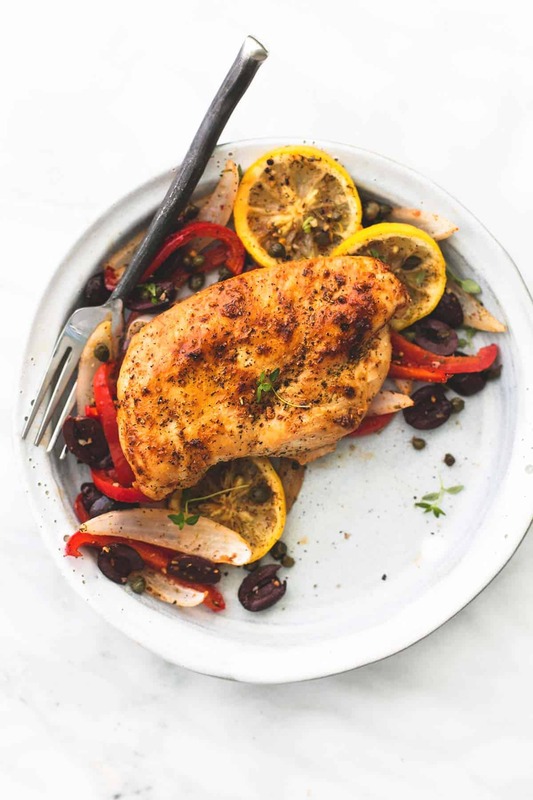 All you need is a handful of veggies, some chicken breasts, a little Mediterranean seasoning (your favorite store-bought OR my easy recipe) and some fresh lemon slices for the ultimate one pan meal. Put this one on your menu, it will not disappoint! 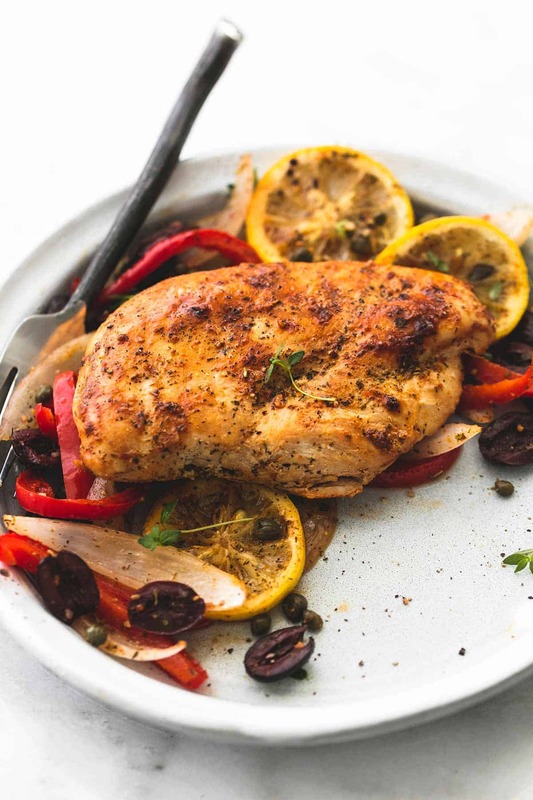 Easy and healthy baked greek chicken & veggies sheet pan dinner is seasoned and cooked to flavorful perfection and couldn't be easier with just one pan and a handful of simple ingredients. Combine lemon sliced, red bell peppers, olives, onions, and capers in a bowl. Drizzle with oil and stir to coat. Sprinkle with remaining Mediterranean seasoning and stir to coat well. 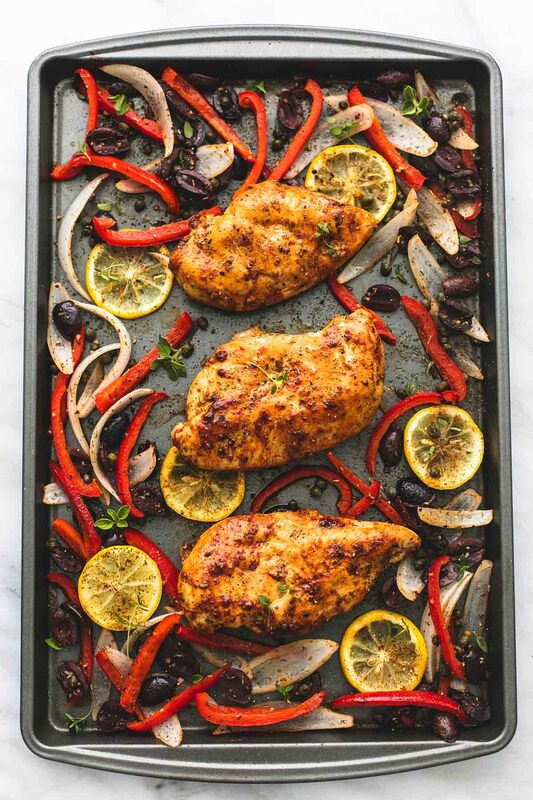 Arrange chicken, lemon slices, red bell peppers, olives, onions, and cappers on a large, greased baking sheet. Bake, uncovered, for 15--20 minutes until chicken is cooked through and veggies are tender. Top with cracked black pepper and fresh herbs (optional) and serve immediately. -I like to cook the chicken in a greased skillet over medium heat on the stove top for 1-2 minutes on each side. This is an optional step but I like the added color and the slightly crispier exterior on the chicken from browning in the pan this way before baking. Try these other Sheet Pan Recipes you'll love! That looks real yummy! Going to make that for dinner. Is it right that we add ½ teaspoon garlic powder AND ⅛ teaspoon garlic powder to the seasoning? Thank you for such a wonderful recipe! Susanne from the Netherlands! Sounds delish! In your recipe for the Mediterranean spice blend, you have garlic powder listed twice. What should it say?